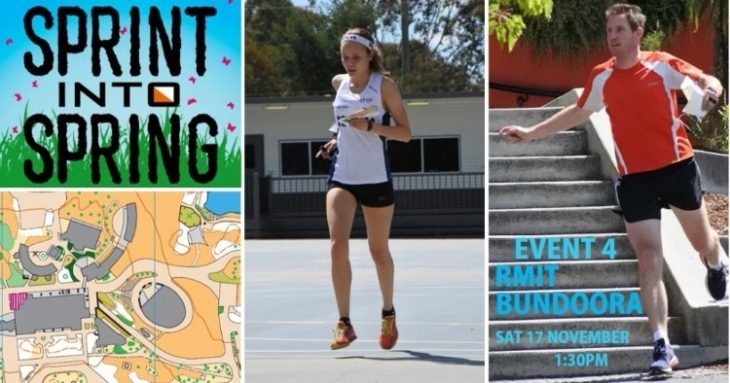 Sprint into Spring this week returns to RMIT Bundoora, but with a new start location the courses will have quite a different feel. Mason Arthur is the course setter and he has set courses with plenty of route choice, changes in direction and decisions to be made on almost every leg. Our hosts, the RMIT Sports Centre, are kindly making their facilities available to us. The event arena is just in front of their reception where you you will also be able to buy coffee or cold drinks before or after your run. Joe and Nathan will be holding the popular sprint training after the event again – so remember to stay on for it. Access to the event is via McKimmies Road, Bundoora. NOTE: This is a different entry than has been used before! Entry is on the day. Bring your SI stick and entry fee to registration and enter using one of the O-Lynx tablets. Start anytime between 1.30pm and 2.45pm. There will be SI sticks available for loan at registration if you do not have one.